Trullo Tesoro is located in the Itria Valley, near Cisternino. This valley is also known as the valley of the trulli because of the thousands typical stone houses with conical roofs. The area is filled with beautiful olive groves and fruit trees. 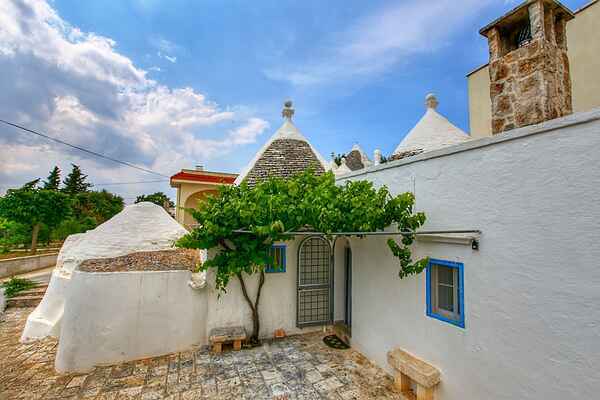 Trullo Tesoro is located in an area of ​​800 square meters with fruit trees. The trullo is simply decorated and there is a large terrace with garden furniture and two hammocks. In summer the trullo cool inside. The solar panels provide hot water. Furthermore, in the garden, a wood oven for baking pizza or bread. Nice trips in this beautiful area, for example, Alberobello, Polignano a Mare, Otranto, Castellana Grotte, Castel del Monte, Grottaglie, Ostuni and Gallipoli. The nearest beach is a 15 minute drive away. There are opportunities for surfing, kite surfing and sailing. Everything is ready for a great holiday at this typical Trullo in beautiful surroundings. Have a great holiday! Guests have 15-hour free internet. The cottage is suitable for three adults or two adults and two children.